Yesterday I finished writing Costume Shop, which I’ve been working on for a couple years. It’s a Halloween story, so I always worked on it in the fall. I’d write a few paragraphs then Halloween would be over and I’d move on to something else. This year I had the beautiful art done by my daughter to spur me on. I really wanted to get it done, and out, so that everyone could see it. So I finally finished it. Which brings us to the next part; editing. And I only have one more day to do that before we get in a car for a week long journey to LA, and twitchcon. I’ve already done a bunch of editing, so it’s only a matter of going back over it once or twice and cleaning it up, but still…. I have to actually do it. If I manage it Costume Shop will be available this weekend. It is an RL Stein style chapter book for younger readers. I might even do a few more in this style…. We will see. For now I am mostly packed for twitchcon. Gregg has a few finishing touches to do tomorrow, and then we start driving. Well I start driving. I’m sure he’ll take the wheel after a much needed nap. It’s just about time for Twitchcon. If you’ve been following me on twitter you might have seen pictures of my boyfriend, Bjornsworkshop, and his giant suit of leather armor! It’s amazing. I love it! I can’t wait to see him on stage at the cosplay competition! We are driving down in October, staying for a few days, and then driving back home to Seattle. It’s going to be a long, exhausting, wonderful trip. And the best part about it is that he was voted in. 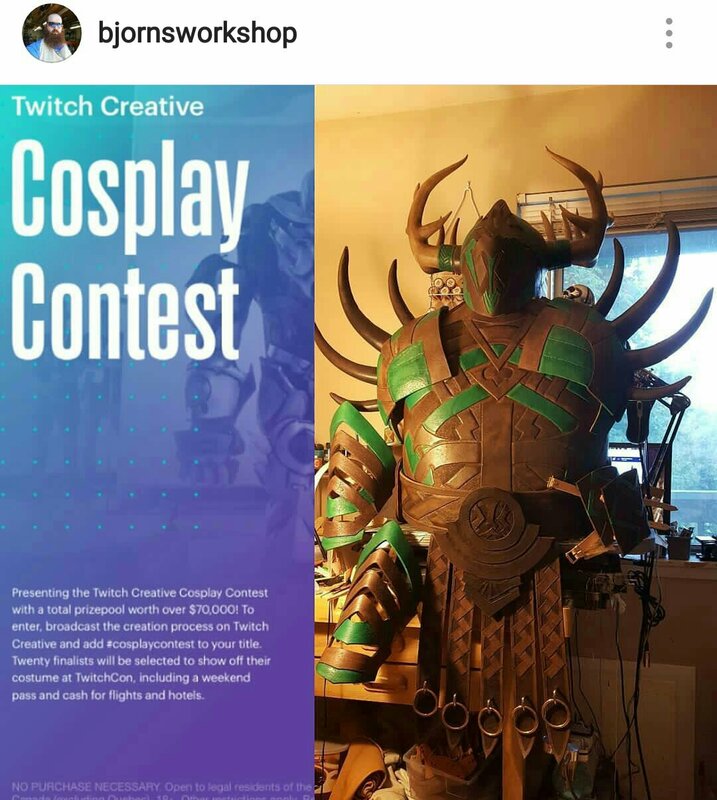 All you wonderful people, and the people in his stream, and family and friends, voted for him so he got the first spot in the armor category! So much love and support, it’s been amazing to watch. We will, of course, be sending out some vids for the trip. We have to share our journey with everyone. Maybe I’ll start vlogging a bit more this evening. Of course his whole build is on twitch right now, too.